They walked the halls at high school. Football games on Friday nights and matching colors at senior prom. They went to college. Made new friends and pulled all nighters. They got degrees. They got a puppy (you remember Lola, don’t you?! ).They got their first jobs. Together. They did it all together. They grew up together. Then, Ben proposed. Brittany said yes. They made a promise. For years, Brittany and Ben have been each others’ very best friend, partner in crime, and biggest cheerleader. And we were lucky enough to watch as the years of dating and loving and fighting and making up and laughing and crying culminated into ONE day. ONE look. Ben turned around, laid eyes on his bride, and it was absolutely magical. They didn’t say too much, but words weren’t needed. You could feel it. The love, the history, and the bond between these two is so strong. It’s undeniable. We’ve loved this couple since the first time we met them. We sat with Brittany for a couple of hours over coffee just talking about life, love and marriage, and knew they’d be such a joy to work with. We’ve been looking forward to this wedding for a while. Not just because we would get to work with one of our favorite planners, Becky at Becky’s Brides, and insanely talented floral designers, HotHouse Design Studio (although that was icing on the cake! Those details were ahh-mazing!). We just knew that the day would be so special because of the awesome people the day was centered around. 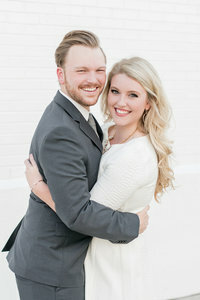 Brittany and Ben are so fun, perfectly sarcastic, funny, easy going, and so sweet, and their day fit them perfectly. From Brittany’s beauty in her gorgeous gown and the hilarious camaraderie between Ben and his groomsmen, to the heartfelt ceremony and the stunning sunset reception, oh friends, what a beautiful day it was! Brittany and Ben, you guys have been through so much together, and oh my word, there’s so much more to come! Here’s to taking on the world together as husband and wife, side by side, through every season of life! You two are perfect together, and we know that you guys have decades of incredible love and happiness ahead of you! We won’t forget your beautiful day, and we were so honored to be a part of it. Thank you for having us and trusting us, and dancing at sunset with us! Cheers to the the new Mr. and Mrs. Thrasher! Bridesmaids Dresses: Bill Levkoff – Bridesmaids Inc.
You guys!!!!! This is so stunning!! Such a beautiful wedding and I’m obsessed with your detail shots!! Oh that first look made me get teary!! So sweet. Gorgeous photos, I love how cohesive everything is! What a gorgeous wedding! Love the details!! Eric and Jamie, these are BEAUTIFUL- I was practically drooling over the details, and it just got better and better!!! Basically I’m obsessed with this wedding. Their getting ready robes, the details, the twinkle lights. Beautiful photos y’all! OMG those details are stunning! BRAVO! Eric & Jamie! Excellent job! I’m totally obsessed with this spring garden wedding!! Not only are their names the same as mine and my husband’s BUT their mint and coral colors are super similar to ours too. Gah! I love every bit of this entire wedding!